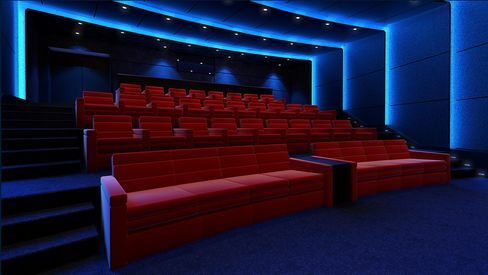 Imax Private Theatre is being marketed to the growing number of high-net-worth individuals in China and the Middle East. Viewers get the highest-quality cinematic experience available, and they will also be able to watch new releases just as they open in theaters, this is a radical development for Hollywood. Imax home theaters in China and Middle East will have $10,000 secure set-top boxes to deliver new movies, called Imax Home Premier, which uses fingerprint security technology, each rental has an additional fee. The company is considering selling this service separately from its physical home theaters overseas. Expansion in the US and Europe is for the theater design and build-out only. Exhibitors are not budging on their fiercely protected, months-long exclusivity windows. Some at-home-theater owners in the US have been using Prima Cinema to get the new movies of some Hollywood studios, at the cost of $35,000 a year for a set-top box and $500 per screening. However the movies are delivered, Imax maintains a very close look on the company’s at-home theaters to assure that the same exacting, high-quality features that any movie fan would find in a major theater are shrunk appropriately to fit a family home. A majority of sales to date have been for newly built homes and targeted to developers, the company says that the roll-out has faced some headwinds from slowdowns in construction and real estate sales. The basic system is the “Palais” setup, for theaters up to 75 sqm, at a cost of $400,000. The set-top box and film rentals are extra. The bigger “Platinum” system accommodates up to 40 guests and costs about $1-M. Sales of both systems are expanding into North America and Europe, according to Imax. Plans for a smaller version called “Prestige,” about half the size and price of “Palais” are also in the works. The new Imax service is catering to a growing class of rich that would not or cannot go to a local theater. Visibility in public s;aces, and in the digital space, and public knowledge of their whereabouts is increasingly something ultra-high-net-worth individuals are mindful of and spending money to step away from. China is where the growth is. A love for Hollywood movies is supporting a boom in the number of screens, with an average of 22 built every day last year. China’s box office is set to overtake that of the US in the next few years. The project is a J-V with TCL Corp., which provides some of the hardware and software for the system. After launching a showroom in Shanghai in June 2015, the companies announced 130 screens had been sold as of April this year. More showrooms will be opened in China, Dubai, and North America by the end of this year, a spokesman for Imax said. From Wall Street’s perspective, it is a low risk strategy and does not cannibalize its main business., and may provide a small boost to earnings in Y 2017. In China, the value of cinema is more than just watching movies, the ability to watch new movies at home is a big change. If next week there is a new movie coming out, people can invite friends to their homes, it is platform for social life. It has been used in Hollywood for decades. Have a terrific 4th of July.